Author: Gerd Grupe, Rainer Polak. Edited by: Michaela Pelican, Katrin Raeithel. 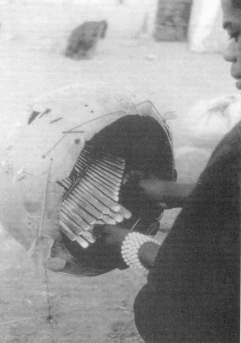 Traditional mbira Music of the Shona (Zimbabwe). 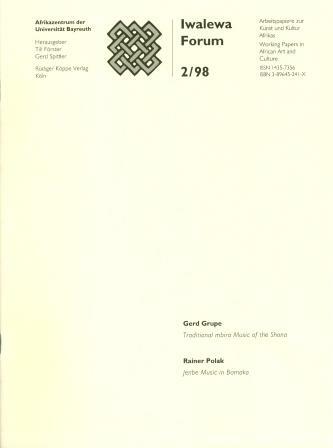 In the traditional music of the Shona in Zimbabwe we encounter a unique feature which is not found elsewhere in Sub-Saharan Africa: long cycles of harmonic progressions which form the basis of many musical pieces in this region. They are most commonly found in the repertoire of one particular lamellaphone, the so-called mbira dzavadzimu or mbira buro of the maZezuru of Central Zimbabwe, in which they typically comprise a sequence of twelve chords. A mbira dzavadzimu consists of usually 22 to 24 keys (mbira) which provide the name for the whole instrument. They are made from scrap metal and are mounted on a hardwood sound board (gwariva) by means of wire or nowadays sometimes machine bolts. Dzavadzimu means of the ancestors or ancestor spirits, which points to the traditional use and function of these mbiras. They form an integral part of ceremonies in which the spirits of the ancestors are called upon and possess special spirit mediums. Jenbe Music in Bamako (Mali). Since 1991 Rainer Polak has been carrying out field studies among a group of professional festival drummers (jenbe) in Bamako, Mali. His research mainly consisted of participant observation including apprenticeship and performance practice as a jenbe player. The drummers allow extraordinary variability concerning microrhythmic realisation of their rhythmic figures. The timing of impulses may fluctuate and swing to an extend that no equal pulse base can be established underlying the rhythmic figure. The repertoire of jenbe music consists of drum patterns which are performed as ensemble rhythms. In Bamako the jenbe drum ensemble performs to the occasion of certain activities. These are mainly marriages and, to a lesser extent, circumcisions, spirit possession, cult initiations and baptism.